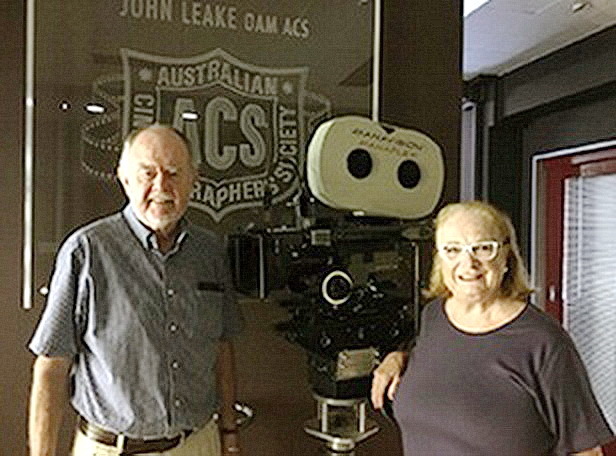 Last week NSW President of the Australian Cinematographers Society, Roger Lanser, hosted two industry visitors to ACS Headquarters, Tim Read, President and Sandra Alexander, Secretary of The Society of Australian Cinema Pioneers. Both were in high praise of the facilities provided to ACS members and of the level of commitment and dedication that members have put into the refurbishment and ongoing maintenance of the facility. Sandra was very impressed by the committee structure and procedures and the monthly industry ‘drop in’ nights, all run voluntarily by ACS committee members. Tim, who has previously been to the HQ, thought the library impressive and a great asset for the ACS as it would be for any Australian Film industry guild. The visit ended with discussion about the enthusiasm we all had for our industry and for the need to keep our societies both fresh and relevant in an ever changing world. Tim and Sandra departed saying how impressed they were that the ACS had such a great facility with which to honour cinematographers of past newsreel, cinema and TV production and which houses the equipment used to photograph and record some of Australia’s most important moments in history and which also presents such a warm and inviting vibe. Roger Lanser, ACS NSW President, himself a Pioneer, enthusiastically welcomed a shout-out to existing ACS members to check their eligibility on the Pioneers’ website, and apply to join the Society. Roger provided a link to the website in the ACS newsletter.